Do you ever buy so-called ‘healthy’ cakes and other snacks aimed at weight watchers and end up disappointed at how flavourless they are? They might only contain 0.0000000000001g of saturated fat per serving, but they’re usually rubbish when it comes to taste. The solution? 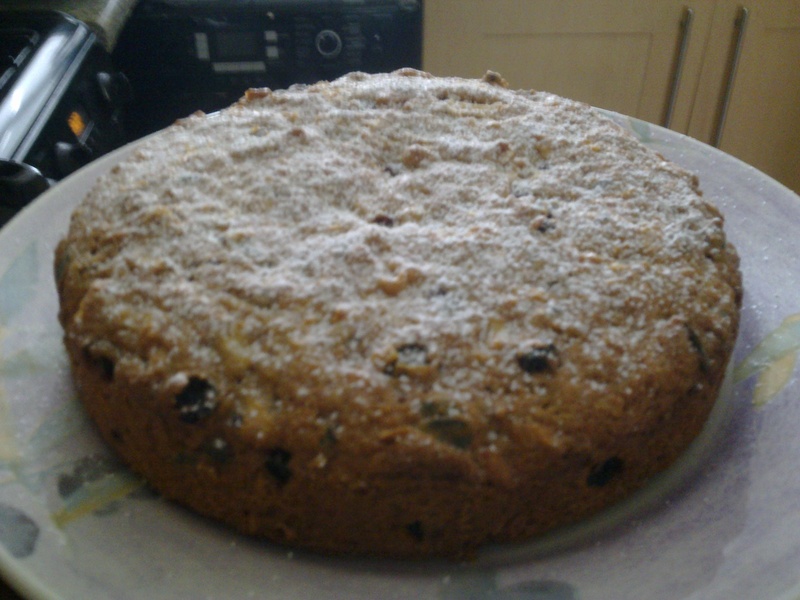 Make your own healthy cake – like this vegan-friendly carrot, apple and raisin cake. I absolutely love this cake – it’s packed with fruit and, most importantly, flavour. Orange juice and zest give it an uplifting zinginess, while pumpkin seeds add a little crunch (and are also low GI). The fat comes from vegetable oil rather than butter (although I used sunflower oil) and there are no eggs – the moisture in the carrot and apple is more than enough to hold it all together. Cut into 12 pieces, the cake has 1g of saturated fat and 207 calories per serving – which I think is brilliant considering how tasty it is! So if you are trying to lose weight, are vegan or generally don’t get on with dairy products, this is the cake to go for when you want to treat yourself. Taken from BBC Good Food 1o1 Cakes & Bakes, and also available online here (obviously grease the tin with something other than butter if you’re vegan or dairy-intolerant! ).